Even with the resources of FedEx and the amazing skills of many wholesale flower companies you just cannot always source a flower that is out of season. Pinterest provides the beautiful inspiration images that capture our eyes and plant the desire for what we want. However, nature itself really determines the best options for planning your wedding flowers. Claire reached out to me approximately 6 months prior to her early April wedding. Her color palette consisted of neutrals with the use of white flowers and beautiful lush greenery. She expressed that she loved peonies and definitely wanted to use them in her bouquet. Peonies are at their peak in the southeast from April to early June and in Alaska early July through mid September. So her timing was perfect for using beautiful white peonies in her bouquet. I knew that with her simple yet elegant design choices that this was going to be a gorgeous wedding. The venue for her ceremony (Eden Gardens State Park) is known for its exquisite, natural Florida landscape. 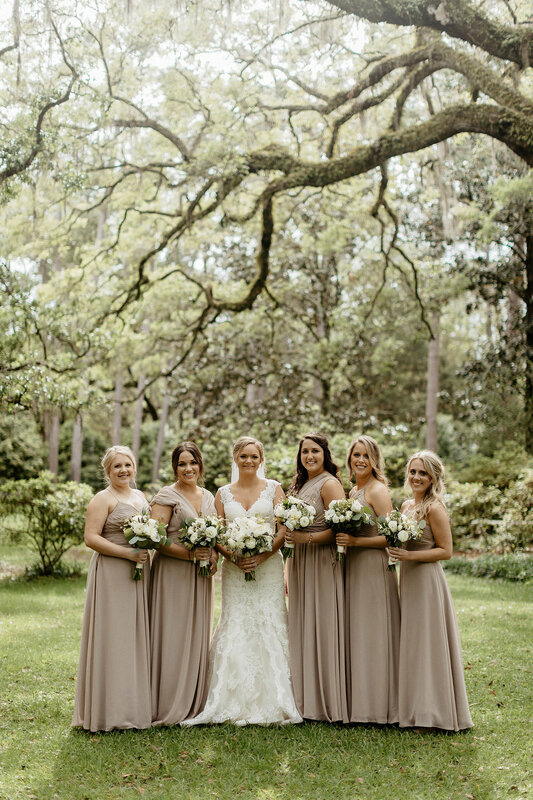 The Grand Oaks with their Spanish moss provide a most beautiful backdrop for a ceremony. When a bride is willing to use what the season or nature is offering it makes for a lovely, more affordable experience, as well as reducing the carbon footprint on our beautiful earth!